ST. JOHN'S, N.L. 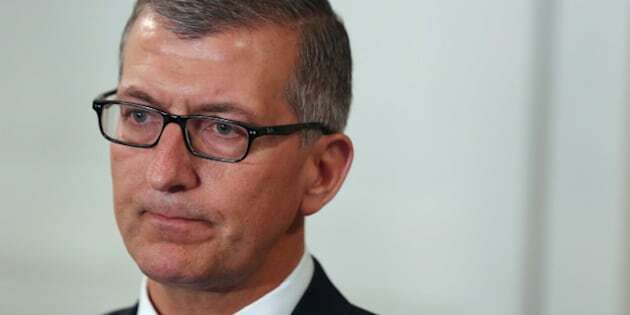 - Newfoundland and Labrador Premier Paul Davis spent his first full day on the job accepting the resignation of his transportation minister over the handling of a paving contract that rocked the first Tory leadership round. Nick McGrath quit Monday just hours after auditor general Terry Paddon's report into the minister's decision to cancel a highway contract on March 13. Paddon repeatedly notes it was the day before nominations closed for the Progressive Conservative leadership race. Davis said outside the legislature that if McGrath hadn't resigned, he would have fired him. "He made decisions in error, and that's clearly reflected in the report and it resulted in his resignation which I've accepted," said the premier. The Progressive Conservative government called on Paddon last May to review the contract with Humber Valley Paving after it became a political hot potato. The company was once led by Frank Coleman, who was in line to become Tory leader and premier before he suddenly withdrew from politics in June citing an undisclosed family matter. McGrath said Monday he hadn't reviewed the auditor general's full report, but defended his decision to cancel the contract without penalty. "I was thinking about the taxpayers of Newfoundland and Labrador," he told reporters. "It had nothing to do with Mr. Coleman. The timing, I agree, wasn't very good. But that's something I have to live with." McGrath said he decided he may have let people down and it was best that he resign from cabinet. He said he intends to stay on for now as the member for Labrador West and will consult his constituents about running again in an election that must be called in the next 12 months. Paddon's report questions the timing of the contract's cancellation. There was about $7.2 million worth of work left outstanding on the $20-million deal to pave 76 kilometres of the Trans-Labrador Highway when the company indicated it wanted out, Paddon told reporters. Forest fires last year in the region had stalled progress and Humber Valley Paving had made inquiries but no formal claim to recoup extra costs, he said. "We have not been able to satisfy ourselves why the process ... to terminate the contract related to (the project) had to be concluded the day before nominations closed for the leadership of the Progressive Conservative Party of Newfoundland and Labrador," says the report. Coleman has said he sold his shares last winter and resigned from the board of directors just before entering the leadership race on the last possible day March 14. He has repeatedly denied he personally gained from the contract cancellation negotiated at around the same time by his son, Gene. Coleman couldn't be reached for further comment on Monday. Opposition critics raised questions about the cancellation and the personal involvement of McGrath, who spoke directly with Coleman's son. In his report, Paddon says the transportation minister "knowingly withheld information" about the cancellation from former premier Tom Marshall. "The deputy minister of Transportation and Works was instructed by the minister not to prepare a briefing note for the premier's office or cabinet secretariat to inform them of the decision," the report says. Paddon told a news conference he would have expected the premier to be kept in the loop because the contract termination had the potential to be politically sensitive. He said in interviews with audit staff, McGrath explained that he thought the decision was "business as usual" and within his authority. "Our view is that we would have expected him (McGrath) to inform the premier's office," said the auditor general. The auditor's report says McGrath indicated to his deputy minister that it was vital the project be finished in 2014 and that the company and related jobs be protected. While the contract termination offer took just over seven hours, Paddon told reporters the new paving tender didn't go out until 37 days later. Paddon said the apparent urgency to cancel the contract on March 13 meant other options weren't fully considered by the Department of Transportation and Works. He could not say for certain whether money was saved or wasted. The report also says McGrath didn't call in related performance bonds because it might have caused delays in the project due to possible legal disputes and could have hurt the company. He also concludes the urgency to cancel the contract on March 13 meant other options — such as assigning the contract to a third-party contractor for its completion — weren't even considered. Paddon does not find "documentary evidence" of undue influence but makes five recommendations. They include that government departments should ensure "normal protocols are followed when dealing with sensitive matters." Opposition leaders said the report raises more questions than it answers. "Was this the reason why Mr. Coleman stepped down?" asked NDP Leader Lorraine Michael. "One can't run away from the political connection here." Liberal Opposition Leader Dwight Ball said a judicial inquiry may be required. "I'm not at all convinced this just happens to be a coincidence around the (Progressive Conservative) leadership," he said in an interview. "People need to get confidence restored that if you're going to participate in tendering and doing work for this province that you can do it without direct minister involvement, and that everyone will be treated fairly."